The World’s Best Wine Magazine? Decanter bills itself as “The World’s Best Wine Magazine” and is sometimes referred to as the bible of wine. It is probably the most influential wine magazine in the world, too, although that could be a contested claim. It is the most-read wine magazine in the world’s most important wine market: Great Britain. Founded in 1975, it is based in London and published monthly in more than 90 countries including, since 2005, China. The Chinese Decanter (click on the image to see the Chinese cover) includes about 30% special content for the growing East Asian market. How can Great Britain (and not the United States) be the world’s most important wine market? The simple answer is that the British produce little of their own wine and import quite a lot, so just about every winemaker in the world wants to compete for British sales. The German market is large, too, but it’s a cut-throat pricing environment with emphasis on discounted price. The American market is big, but it is tough for international winemakers to compete with American wines at most segments of the market (especially for popularly priced branded varietal wines). A slightly more complex answer is that entry into the British market is relatively straightforward, because it is for all intents and purposes an integrated national market with one set of rules and distribution channels. The American market is a maze, with 50 (plus the District of Columbia) different sets of rules and regulations to understand and comply with plus the nightmarish “three-tier” distribution system (retail/wholesale/producer) that adds cost and increases the mark-up at each stage. You want national distribution in the U.S.? Better hook up with one of the big brand managers such as Constellation Brands or Cobrands. And you’d better have a lot of product to sell. Otherwise you should settle for regional distribution and hope for the best. No wonder many international sellers focus on the British market or go there first. Decanter is published by a company called IPC Inspire, which produces a number of lifestyle monthlies including Country Life, Horse & Hound, Rugby World, SuperBike, Shoot Monthly and Yachting World. It is Britain’s largest specialist magazine publisher. Although Decanter really is arguably the most important wine magazine in the world, it is not as ubiquitous as Wine Spectator and Wine Enthusiast here in the United States. You won’t find it on many supermarket racks. Like Robert Parker’s Wine Advocate, it attracts a specialist audience in America. Decanter was founded in 1975, just at the moment when the British wine market was becoming the world’s most important. Most American’s think of the British as a beer and spirits drinking nation, but this has not always been the case. The British preference for ales and whiskey was partly the result of a tax and regulatory regime that biased the system against consumption of imported wine. High tariffs made wine expensive and retail sales regulation made it inconvenient to purchase. Britain’s entry into what is now the European Union resulted in tariff rates more favorable to wine imports. Mrs. Thatcher’s programs of retail industry deregulation opened up the opportunity for cheaper wine and more convenient distribution, especially though the supermarket chains. These supermarkets – Tesco, Sainsbury and Waitrose among them – became world’s most important wine distribution channels. The produce of the world’s vineyards are now sourced to these British stores and, having made an impact there, have passed into the global market. Costco, I have argued elsewhere, is beginning to play a similar role in the United States. Ironically, U.S. wines are underrepresented on the British market. The U.S. and British distribution and marketing systems are so different as to represent a barrier to entry, at least for now. Decanter was created to serve the consumer market created by the explosion of wine in Britain. As the global market has grown, Decanter’s distribution has followed (and sometimes, I suspect, leads the way). If Decanter is so important, why doesn’t it have a stronger presence in the United States? The answer, I would argue, is that the British wine market is global and dominated in terms of volume by the large national supermarket chains selling wines from all over the world. The U.S. market is far more local (favoring American wines) with a far more fragmented distribution system and large firms like Gallo and Constellation Brands leading the way, selling branded wines from their large portfolios. Simply put, you won’t find a lot of the wines reviewed in Decanter in American stores. As vast as our selection is here in the U.S.A., it’s just a slice of what the global market offers. Really. Decanter is a full service wine publication with something to offer almost any British wine enthusiast. There are interviews, topical essays and regional travel surveys (drink this, stay here, try this place for dinner). Columnists include such notables as Michael Broadbent, Steven Spurrier and Andrew Jefford. Decanter obviously includes wine investors among its readers because it contains very detailed monthly reports on wine auction sales prices. Bordeaux reds and the main focus (vintages dating back to 1961), but white Bordeaux, Burgundy and Port prices are also listed. It even publishes a wine auction index. This probably reflects Broadbent’s influence – he was for years head of the wine auction practice at Christie’s. The monthly wine ratings are very interesting. Rather than try to sample a selection of all the new wines on offer each month as some American publications do (an impossible task in Britain, I reckon, with so many wines), one or two types of wines are chosen and about 100-150 wines from each of those segments of British market are tasted and rated. The February 2008 issue, for example, has comparative ratings of just two types of wines, South Australian Shiraz and Loire (France) Reds (Cabernet Franc to Americans). Wines are first rating using a 20-point scale (with average scores from several tasters reported) and then grouped together into quality classes ranging from one to five stars. The five star (18.5 points or more) and four star wines (16.5-18.49 points) are listed along with photos of their bottles for easy identification in the shops. Three star wines get nice write-ups – this, after all, is where the real market is – and lesser wines are listed in appropriately grim tombstone format. It’s hard to imagine a Decanter reader buying a “fair” or “poor” wine except by accident. I am impressed with the information provided for each wine. Besides the average 20-point rating, we learn the retail price, the degree of age-worthiness, receive brief tasting notes and find out where to buy it. Good value wines receive a gold £-sign designation. Thus, for example, the 2006 Shingleback Cellar Door McLaren Vale is rated at 14.75 points and sells for £7.99, which is a good value. Is has short term aging potential and can be purchased at Tesco. “Dark cassis jam notes. Medium body. Nice spicy notes. Fine velvet texture. Ripe and well-balanced fruit. 3-8 years.” Sounds good to me. Lots of useful consumer information here about these particular wines, although each monthly issue rates only a small slice of the British market. The “stockist” listings are noteworthy. Wine Spectator will tell you what to buy, but not where to buy it. That would be nearly impossible in the U.S. The reason Decanter can tell you where to buy this wine is that the British wine system favors a relatively small number of national distributors and retailers, many of whom feature their own brands, much as Costco does here in the U.S. with the Kirkland label. The best value in the Shiraz tasting, for example. Was Berry’s Own Selection Elderton Australian Shiraz Barossa Valley 2006 (£8.50 and 16.5 points). “Big yet somehow seductive.” Berry isn’t a person, it is Berry Brothers & Rudd, a major British retailer. Decanter wine critics are tough, by the way, stingy with the highest grades (the 4-5 star As and Bs) but generous in giving Cs that seem to really mean something. Decanter reflects the unique features of its main market, Great Britain, which makes me realize that this is probably true about all wine publications. Gambero Rosso has a strong regional focus because the Italian national wine market is less important there and regional identities matter more. U.S. magazines will be different because the U.S. market is so different. Britain’s market is national in scale and global in reach so Decanter‘s strengths and weaknesses (particularly its inability to evaluate the majority of wines that are available) reflect this. I am not surprised that it would appeal to wine-drinking elites around the world, but it makes sense that it would not have a big market in the United States. The market is just too different over here. An impression, ithe economic information provided by the blog is a mix of theorectical and real. A fair criticism is that the blog is not able to be as authoritative about real elements of the wine industry as it can be about the theory. The topic of the media brings this into the open. Media? 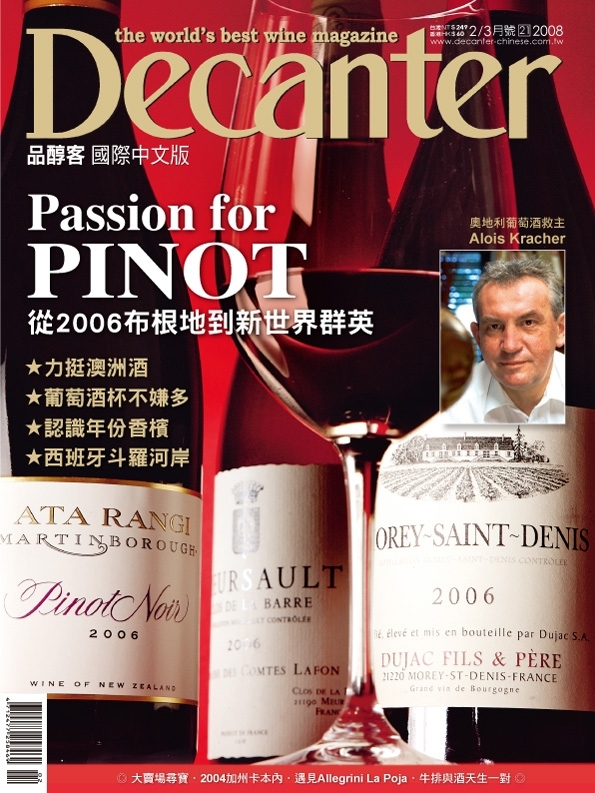 There has been a failure by American publication to bring Decanter like copy to the consumer. Why? European based publications are replaced by measurements, quality scores. Economically, consumers have not supported the American attempts to foist the Euro style wine speak on them for economic reasons. This says quite alot about the fine regional versus global wine industry. We would like to see this blog make predictions about specific elements of the wine industry. Link the elements together for us, with Harvard Business School styled case-histories. By example, connect Decanter, Robert Mondavi Winery’s sales December 2004, to scores and prices. Please, take more of a risk, make a prognostication or two about the real world of wine. Thanks for the critique and advice.